To kick things off I am heading back 34 years for my first nomination, Total Control by The Motels.. I just adore this song for the way it never ever goes over the top, but chugs along in a menacing Twin Peaks fashion. It’s all about the baseline, the vocal and a whole lot of space. It reached 109 in the US and didn’t chart in the UK. As with this choice, for most of my nominations the videos are likely to be blurry, with retro VHS static or in a few cases non-existent, but that goes hand in hand with them being overlooked. Abandon all hope of HD 1080p over the next ten days. 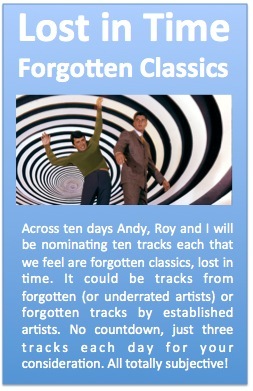 Never heard this before – but why should I – its a ‘lost classic’ ? Its a bit too Kenny G meets Europop for my liking. Don’t let the big hair put you off! This is my first choice. ‘Can’t Help Thinking About Me’ was recorded in 1966 and is credited to ‘David Bowie and the Lower Third’. Its the first single released using the ‘Bowie’ name and his first US release. This fine piece of sixties mod-pop failed to chart in the UK or the US, not even when it was re-released in 1972 to cash in on his increasing global fame. A true ‘forgotten classic’. Not heard this before, but like it a lot, particularly the lyrics and the authentic vinyl crackle…. Hmm, a pair of interesting choices to kick off proceedings. Glancing through my list, I feel I may have interpreted “forgotten classic” in a slightly different, and possibly less obscure, way. However, I guess that’s all part of the fun, isn’t it? So, for my first choice I’m going back around 25 years. It’s a song that does receive some airplay, but I feel that it deserves a more frequent airing. Contemporaries of Prefab Sprout, a friend of mine mentioned it recently and it kind of struck a chord, with the following lyrics being particularly poignant…. Simple yet poetic, that’s always been the key.